If you have been by the Chester campus library in the past few days, you may have noticed the blue and white prints on display by the exit doors. They are cyanotype prints! Chester library will be hosting a cyanotype-making workshop on Wednesday, February 6th, during the Get Connected Festival. The festival is from 10 a.m. to 1 p.m. on the first floor of Moyar Hall. But what are cyanotypes, you ask? Look no further. The cyanotype is a photographic printing process that produces blue prints using coated paper and light. The process was discovered by the scientist and astronomer Sir John Herschel in 1842. Herschel used the cyanotype process so that he could reproduce mathematical tables along with other notes and diagrams. 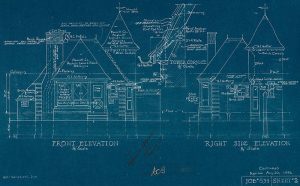 Architects and engineers later picked up the process to produce copies of architectural drawings, which is also where the term “blueprint” comes from. 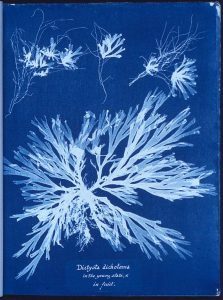 Shortly after Herschel developed the cyanotype process, his friend, photographer Anna Atkins, started exploring the process for book illustration by making cyanotypes of plants. She used the method to produce the first book that included photographic images, titled Cyanotypes of British and Foreign Flowering Plants and Ferns. 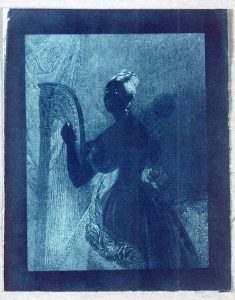 Cyanotype by Anna Atkins, 1843, from the New York Public Library. Cyanotype by Sir John Herschel, 1842, from the Museum of the History of Science, University of Oxford. 1936 Architectural Blueprint for Joy Oil Gas Station, City of Toronto Archives. Cyanotype paper is made by combining two different chemicals: Potassium ferricyanide and Ferric ammonium citrate. These chemicals are mixed with water and then blended together in equal parts. Absorbent material such as paper or fabric is then coated with the solution and dried in a darkened room. The chemicals coated on the paper react to UV light to make the print. Prints can be made by exposing the paper to direct sunlight, or a UV lamp. How do the images appear on cyanotype prints? After the paper is coated with the chemical solution, any part of the surface that is exposed to direct UV light will react and change color. Cyanotype photographs can be made in two ways: by using a photo negative, or by placing an object directly on the paper that is being exposed to the sun. Wherever the object blocks out the light the paper will remain white, and wherever the light hits around that object will react and turn blue. This method produces a print called a photogram. The prints are processed, and the material is stabilized by rinsing the paper in water. Come see us at the Chester campus on February 6th and make a cyanotype of your own! This activity is weather-permitting, as photograms will not expose well if it is too cloudy or rainy. Atkins, Anna. Dictyota dichotoma, in the young state; and in fruit. 1843, New York Public Library. Accessed January 29, 2019, from http://commons.wikimedia.org/. Blacklow, Laura. New Dimensions in Photo Processes a Step-by-Step Manual. 3rd ed., Focal Press, 2000. Fabbri, Gary, and Malin Fabbri. “Cyanotype – the classic process.” Alternative Photography, http://www.alternativephotography.com/cyanotype-classic-process/. Accessed 29 January 2019. Herschel, John Frederick William, Lady with a harp. 1842, Museum of the History of Science, University of Oxford. Accessed January 29, 2019, from http://commons.wikimedia.org/. Joy Oil gas station blueprints. 1936, City of Toronto. Accessed January 29, 2019, from http://commons.wikimedia.org/.